I'm very particular with my clothes. I like to keep them as stain free as possible. In the event that I do get a stain on my clothing, I want to turn to a detergent that is powerful enough to kick those stains to the curb! We've all had stains on our clothes and we want to use a quality product to keep our clothes looking their best. All Laundry Detergent is a recognized leader and laundry partner with consumers for more than 50 years. The brand provides an incredible clean at an unbeatable value. All has many detergents in its laundry lineup. If you have sensitive skin, All Free and Clear, which is free of potential irritants like dyes and perfume is the pick for you. It is also hypoallergenic. It is uniquely formatted with SkinSmart Surfactant technology, which has a proprietary blend of active surfactants that tackle kids dirt and stains while being gentle on your family's skin. It removes 99% of top seasonal and everyday allergens with every wash. Looking for a great stain removal product? All Free and Clear with Oxi-Active is your go-to choice for heavy-duty stain removal. It tackles your family's toughest dirt and stains with stainlifters and the added power of natural cleaning boosters helping to give you incredibly clean clothes. I've only used All twice previously, but I was very pleased with the results. Did you know that All is the #1 detergent brand recommended by Dermatologists and Allergists for sensitive skin, and the #1 free detergent brand recommended by Pediatricians. All is there to make sure your family's clothes look and feel their best. I was able to review an All laundry detergent of my choice. The coupons came on laundry day which couldn't have been more convenient. I also was running low on my regular laundry detergent too. I walked to my local Target with laundry dreams dancing in my head. When I got to the laundry care aisle, I surveyed my options. I finally settled on All Free Clear Oxi Active. I was promised incredibly clean clothes and stain lifters to whisk away my stains. This was definitely the right option for me. Earlier in the week I accidentally got a stain on my shirt while cooking. I knew I needed a strong stain lifter to help my shirt. The bottle is a nice solid white with an eye-catching "All" written in yellow and blue. The colors stand out and you can't miss the bottle in your laundry care aisle. This detergent is safe for all washing machines. I loaded my laundry into the machine and prepared my clothes to be washed like never before. I did not add any stain removal tablets or anything to help the stain removal process. I wanted to see what All could do for me on its own. The product easily poured into the drum of my washing machine. Soon after that, it was time to transfer the clothes into the dryer. Of course I had to inspect the shirt before I switched it over. The stain was gone! I was very thankful as it was a chocolate stain from baking, and those can be hard to get out. I was prepared to have the stain not be fully removed, but it was. I was impressed. The clothes dried beautifully and looked fantastic. They definitely looked like they were washed with a high quality product. I smelled them and they had a wonderful clean scent, a scent that can only mean a true clean. I really liked how well of a job All did with cleaning my clothes. 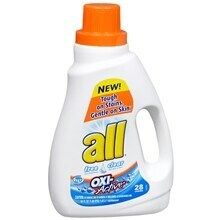 All's Oxi Active is one product I will be keeping in mind for my tough stains. I used all detergent before. I use ALL and I like it, especially when I find it on sale. Yes, I have used all degtergent before. Yes, I have, and I really like it. There was a time I needed perfume free detergent and ALL Free and Clear was the only one available. So, yes I've used All for almost 10 years now. I haven't used All detergent, but I would love to try it! I haven't used All detergent before, but I would love to try it out! I have, but it's been a long time. no,I havent tried this kind before,but would like to. I have used All. It's one of the top trusted brands. I have never used ALL detergent before but Id love to try it!Ive heard good things about it! Yes I've used All and was pleased with it. We have used ALL before! I am sure I have used All in the past. I have tried the All Unscented, no perfumes or dyes. Really good product. Yes I've tried All, All Small & Mighty and All mighty pacs and yes I love'em ALL! I've used the All Free before. I get what ever is on sale so I have used all before, I liked it a lot. I have used it before and loved it. I don't think I've ever tried All. Yes. All is the detergent I regularly use. I have never used All before. I have used all before, but I dont usually get it since it's more expensive than others. Yes, I use All Detergent. Yes, I use it often. we use all free and clear in my house. Thanks for hosting! All is the only laundry detergent that I use. I love All, it gets out the grass stains on all my daughters jeans. I have used it for years. I love it! This would be such a blessing to my family! Yes, I have used All products before. Yes I use All sometimes and I really like it. No I haven't used it before. I'd love to try it. I have used the All detergent previously. I've never used All brand detergent before. All Free and Clear is the only brand I'll buy. I use ALL most of the time. we have used it a few times before. I have not used All laundry detergent before. All is my favorite detergent. I have used all free and clear. I have used ALL before. This is my favorite detergent. I use it all the time. I have not tried all of them But I wish to use then in my cleaning work too.